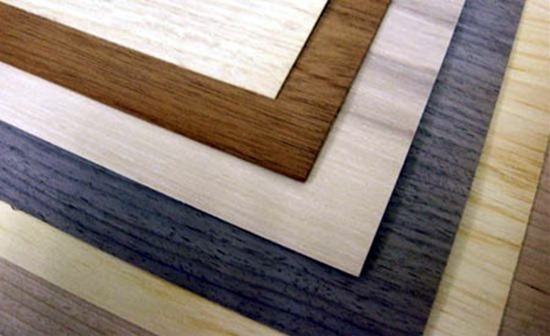 What’s the difference between laminate and wood veneer? And can I paint it? Now, we don’t claim to be professionals by any means, but we’ve been around the block with ALL our furniture transformations… and we’re happy to share what we’ve learned! Let’s start with the definitions of each… because they’re totally different things. A thin layer of hardwood (usually thinner than 1/8/inch) that is bonded to a less expensive surface below (often a cheaper wood, particle board, or MDF). This allows the manufacturer to create a beautiful piece for less than it would cost for a solid wood piece. Often, if the veneer is in good shape, you can’t even tell that it’s not solid. This photo is to demonstrate how thin the layer of wood is. A man-made product (usually plastic) that is actually ‘printed’ to look like it has wood grain. It allows manufacturers to create furniture, cabinets, and flooring for less money. You canNOT stain laminate. It’s not wood! The stain has nothing to soak into, and will literally sit on top of the laminate and never fully dry. It will be a nasty sticky mess forevermore. If the veneer is in good condition and isn’t chipping… you can sand, prime, and paint like you would any piece of furniture. 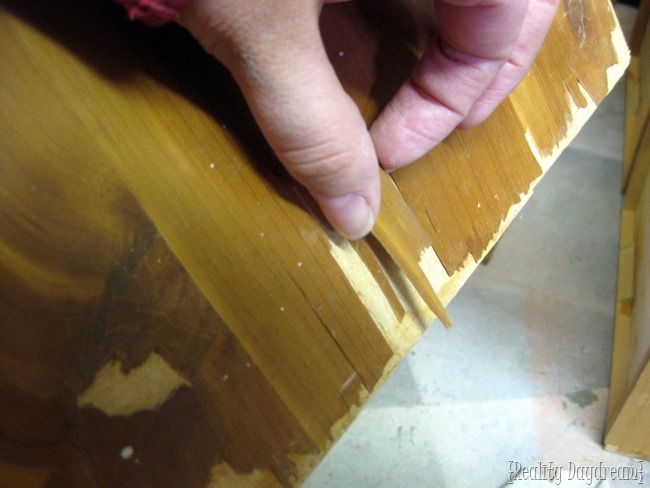 If the veneer is damaged or has chipped off in some places, but isn’t loose and flaky… you can either fill it with wood-putty and sand it smooth, OR you can embrace the character and prime and paint right over it. BUT! If the veneer is chippy and loose to an extreme, and the damage is widespread… it’s really best to replace it with a new slab of wood like we did with Dawn’s woodgrain butterfly dresser. Do you see how loose and irreparable this veneer is? Another option is to chip off the veneer with a putty knife, like we did on this buffet. With a little elbow grease, the veneer came off (one splinter at a time), and then there was a lot of sanding involved to cut down that chunky adhesive. But in some cases this would be less work than actually replacing the wood. 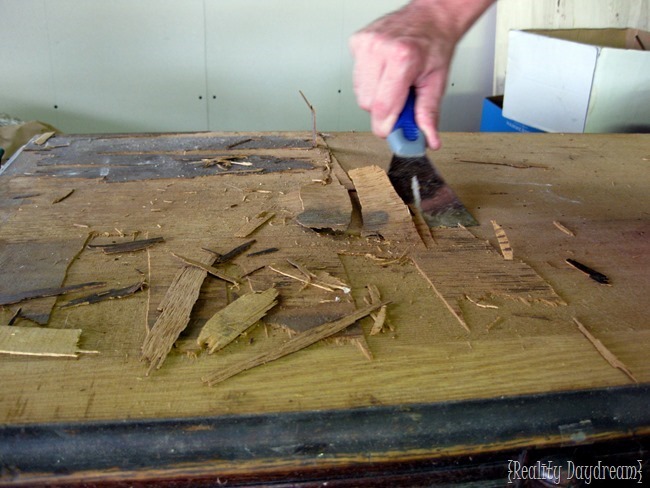 It may also help to soak the wood with a wet towel for awhile to loosen up the adhesive. 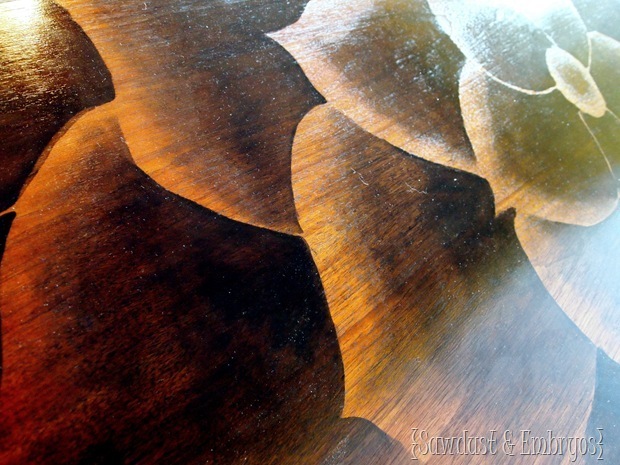 NOTE: Because wood veneer is actually real wood (and often has a beautiful wood grain), you CAN stain and varnish it! However, be careful if you’re using an electric or belt sander, because often the veneer is so thin that aggressive sanding will wear though the veneer quickly. Also, because it’s real wood, it’s important to sand in the same direction as the wood grain. I have GREAT NEWS (no we’re not pregnant… why does your mind automatically go there?) You can sand, prime and paint laminate as if it were a solid wood piece of furniture! 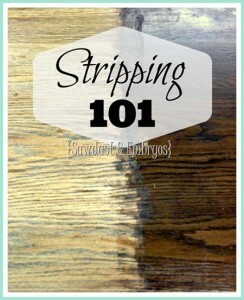 It’s easy to skip the sanding step, because sanding is a drag… but it’s especially important with laminate. Because it’s often somewhat glossy-looking, and important to sand it down until the finish is very dull before priming. We recommend using 120 grit sandpaper for this. And, unlike real wood, it’s unnecessary to sand with the ‘grain’. While the finish will be just as durable as if it were applied onto wood, laminate furniture by nature, is built more poorly and isn’t as heavy-duty as a solid wood piece. But next time you’re at the thrift store or a garage sale and you spy a laminate piece… IT CAN (and should) TOTALLY BE PAINTED! Best news you heard all day right? That and it’s almost the WEEKEND!!!!!!!!!!!!!!! Questions? Comments? Have you had any luck removing veneer using a different method? Are you doing any furniture-updating of your own this weekend? Have you tried our tutorial on making new wood look old? Be sure to check out our furniture transformations, and other tutorials! 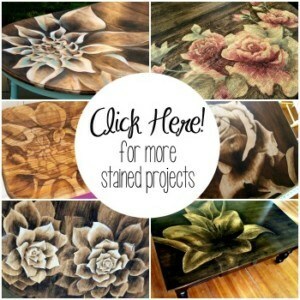 And you might also be interested in our tutorial on stripping furniture, and our other posts on various Finishing Techniques! I have a table, chairs, and hutch that all go together and have a lot of curves and detail. I am not sure how to go about painting them. I want a rustic type look. They are currently brown and I want them to be black and gray. The table is laminate top and the rest is glorified particle board I believe. Got them at an estate sale so I don’t know much about them….any help or advice would be much appreciated!!! Your post was extremely helpful! A friend of mine gave me her west elm mid-century 6 drawer dresser and I want to paint it. The online product description says that it’s kiln-dried solid eucalyptus wood and engineered wood with an Acacia wood veneer, so I plan on following your instructions for painting veneer. My first question is what type of sandpaper would work best for this project? The unit does not have any damage. My second question is what type of primer and paint do you recommend? This is my first DIY project like this so any tips would be really helpful. I would just rough it up with 120 grit sandpaper to take the ‘sheen’ off the piece and make it very matte. 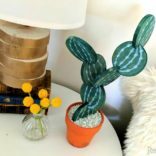 Then prime with this stuff (aff)>> https://amzn.to/2RNXLPs and paint with Sherwin Williams’ Emerald Urethane Trim Enamel in any color you choose! It’s the BEST paint for furniture, and very durable. Hope this helps! I’d love to see a pic when you’re done! and fake wood grain. Excellent shape but not as dark as I would like. I don’t know if I should leave it or paint it teal or gray. If it’s authentic mid-century, I would leave it as-is! But that’s just me. 😉 I won’t judge if you decide to paint it. You’ll want to make sure you sand it down good, and prime with a good oil-based spray primer like Kilz before painting. Best of luck! Thanks!!! I’ve got this little laminate end table that’s wearing and I’ve been so looking for a way to spruce it up, but wasn’t sure about the sanding part. It’s one of those silly little pieces of furniture you get attached to because it comes in handy in so many ways! Hi, I sanded down my laminate kitchen cabinet side boards using a hand sander but I over sanded on a few of the edges showing abit of particleboard. We are getting the kitchen spray painted in week. I’ve primed over the sanded through darker edges and sanded it so it is smoothe however I was wondering if this will last or I need to fill the space with a filler? It doesn’t really seem deep enough to fill as it is just the pain layer and I’ve sanded it quite abit. Just want your recommendation please!! Since you’re painting and not staining, you should be totally fine! Hey Valerie! Sounds like a fun project! All you really need to do to keep things from bleeding through is hit it with coat of oil-based primer. I use the spray Kilz brand. Then sand it after that’s dry, and you’re ready to paint! You can paint it with really anything, but I’m a spray paint girl. Spray paint is oil-based too, so it’s super durable and less likely to crack over time than other paints. You can also get a very even/perfect finish without brush strokes from a paint brush, or stipling from a roller. But that’s just my two cents. There are tons of different strategies. You really can’t go wrong! Thanks for pointing out that the veneer type of wood furniture is real wood, so it can be stained and varnished again. I guess I will be choosing this type of material for our kitchen cabinets so that we can restore it easily over time. We just needed to have custom cabinets produced for our kitchen because there are odd spaces in that room which can be filled in by ready-made furniture. I have an older desk I wanted to restain the top and paint the bottom and drawers. Once I started sanding the top we noticed it was laminate. My husband peeled off the piece of laminate and Now I have what looks like particle board underneath. I’m trying to figure out where to go from here. I really wanted a stained top. Do you have any suggestions? Well you definitely don’t want to stain particle board. 🙂 If you have your heard set on staining the top, you could either remove the particle board and put on a new slab of wood, OR buy a roll of new wood veneer at your local home improvement stores. 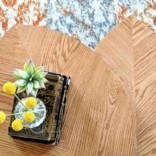 There are lots of good tutorials out there for applying wood veneer. Whatever you choose, good luck to you! My husband said I should just paint it. What do you think? Is there something I can put on the top of the paint that will make it more durable for writing on? This is my first project and it’s a laminate piece but it’s been a learning adventure to say the least. Mid way through I found a water damage spot in the lower edge of the 70’s style end table cabinet style. The damage goes around to the side as well. Can I use Bondo to fix this as well as it is laminate? If I sand it down and primer over it? Thanks. It’s hard to know without seeing the piece, but bondo may work. It’s an amazing product! If the water damage is bad enough, you may need replace that side of the cabinet if you want a perfect surface. I was thinking I would have to paint the wood portion. Good to know I have the option of painting the whole piece. And you explore it nicely. I too would like to know how to repair chipped laminate.Thanks for your great information and also helpful. Hi there! Any suggestions on what to use to seal a veneer tabletop? I am more concerned about water spillage causing the veneer to bubble up or rise. This will be an everyday used table that my family will sit at. Thanks for any info you can provide! Hey Penny! I would use a good oil-based polyurethane. The sheen is totally up to you, but just make sure that you follow the instructions, dry times, recoat times, etc TO THE LETTER! It matters! Can I use regular primer paint (not spray) as my primer? It’s a coffee table. I have laminte shelf I want to paint from Wood grain to black. I would rather not sand it. Could I get away with not sanding it? haha What could happen if I don’t? Also, I heard I could use a paint WITH primer and it would be easier. Any negatives on that? Do you think I can paint inside the house or will fumes be too much? Thank you! Hey Michelina! So sanding makes things more durable, but since this is a shelf and not a dining table, I think you can get away with not sanding. Although don’t be surprised if the paint starts chipping off in a couple years. 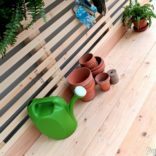 You can totally use a primer/paint combo, but since oil-based paint is very toxic and fumey, you’ll definitely want to do this outside. Or plan on not living in your house for a few days while it airs out. LOL! Hope this helps! Bethany, If going the route of not sanding a decorative laminate piece, what brand/type of primer/paint )oil based) would you recommend? I’m looking to paint 2 tiny nightstands from “fake ” wood tone to black-semi gloss. My first attempt at this. Hi – Can we use veener and make curved bends. For example a Round / Circular shaped bed. Can veener bend? Yes Absolutely! Veneer is very thin and actually comes in a roll! I’m not sure what I have, laminate or veneer. It’s got a high gloss, not chipping or damaged, wood grain, not sanding well, and I don’t know what to do. I want to refinish it though. Please help. It’s almost impossible to tell you whether you have laminate or veneer without being able to look at it myself. If you’re sanding and it’s just turning a white/filmy color, I’m guessing it’s laminate. But if it feels like you’re sanding down through a glossy clear coat, you should eventually get down to the wood and be able to re-stain and varnish. Does that make sense? I hope this helps! Hi Taylor! Since you’re wanting to get a different bed/headboard than your matching bedroom set, you can always go to Sherwin Williams and have them make a custom color of stain to match your existing set! It’s a wonderful service. We had them match out flooring stain to fix a patched piece on the floor, and it’s a perfect match! Can I paint veneer bedroom set without sanding? Also looking for the same advice. I’d like to paint a brand new birch veneer electric fireplace tv stand. It’s brown and is like to make it white. Suggestions? I think you’ll have the most durable results if you sand before painting, but you could probably get by as long as you use a really good oil-based primer before painting. Hope this helps! So glad I came across this article! I am using an old entertainment center that is laminate for a DIY play kitchen for my niece. 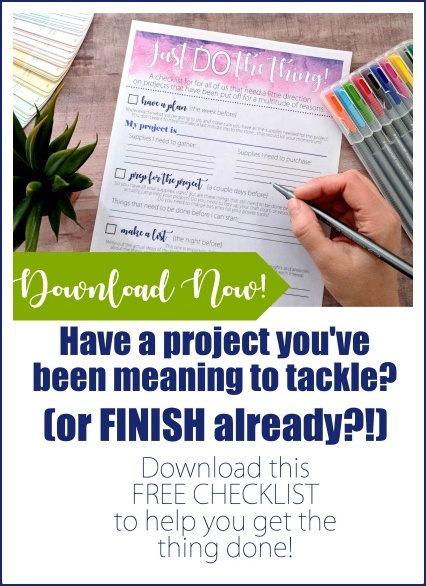 I am so not a project doer, but I really want to be! Haha! What steps, (in order) haha, Should I follow for painting it? Any specific products you recommend? My biggest fear is the paint will chip off and it will not be able to be played with… any help is so appreciated! Yay, that sounds like a fun project! I would sand the whole thing down to get rid of the ‘sheen’, and then prime with a good oil-based primer (like spray Kilz or BIN), and then paint! Since it’s going to get lots of ‘use’, I would consider putting on a protective coat of poly. Oil-based is the most durable, but it yellows over time. So if the base color is white, I would stay away from oil-based poly and stick with something water-based like Minwax Polycrylic. Hi Bethany! I bought an old bedroom set to restore. Didn’t know what laminate was. It was a cream color and I’m painting it white. I have spent total of 8 hours painting two base coat of paint+ primer and I’m planning on painting it two more times with the white color I want. The problem is, when something touched the pieces the primer that is sitting on top chips off. I’m so sad. Should I sand the whole thing down and get rid of the primer and scrach the surface for bundling? I probably am better off throwing all the pieces out than doing that. Please help! Is there anything I can do to save my work? Thanks. Oh noooo! That’s so frustrating huh! When paint or primer is chipping off, you want to get all those loose pieces off. The most durable way to do this would be to sand/strip EVERYTHING off, sand, and start over with a good oil-based primer. This will give you a finish that will last for many years. But if you want to try a shortcut (I can’t guarantee the results) but you could take a stiff wired brush and scratch the whole thing up to get any loose-ish pieces of paint off, then sand to smooth over those rough spots and rough up the entire surface, and prime/paint. Sorry you’re going through such a frustrating furniture situation. It’s happened to all of us! Oh no! That’s a nightmare! Since I’m a perfectionist, the shortcut doesn’t satisfy me! Need to strip everything down. I live in an apartment and need the space these pieces are taking. So, need to finish up this project ASAP. Is there another way, like using a top coat? One of those stiff clear one some furniture have? They seem to keep everything together?!?!? Thanks so much for your input. I appreciate it very much! I have an office desk with a black laminate finish. The laminate is very thin and wearing through in spots. Can I sand (120 grit) and prime using spray Kilz. Then repaint it black and finish it off with water-based like Minwax Polycrylic? Yes yes! That’s exactly what I would do! I’m not sure if you’re talking about just doing this in the spots that are wearing, but I would absolutely just do those steps to the whole piece. There’s no way you’d be able to match the finish if you’re just painting here and there. Good luck! What’s the best paint to use when painting laminate? I’m going for the farmhouse look. Hi Dallas! As long as you prepare the laminate by sanding it to rough up the surface, and prime with a good oil-based primer, you can use any kind of paint! If you’re going for the farmhouse look, I would use a flat or ‘matte’ finish or chalk paint. 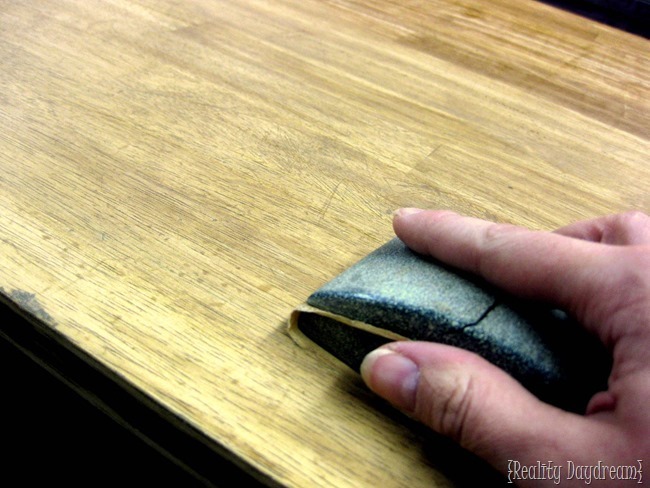 You could sand off the edges when youre done too if you want it to look rugged and aged. Good luck! Hi! Love your article! I would like to paint my kitchen cabinets which are engineered wood. They look like custom cabinets but are kits made to fit. The finish is a cream color with a brown glaze in the creases. How would I go about prepping these (primer, sand) and what type of paint should I use? have you ever painted over laminate counter? If so, how? I have not, but I know that it’s been done. I would do some google searching for tutorials! Hello! lovely article… I’ve been trying to find the answer to my questions but had no luck yet… hopefully this is THE day! So.. I have a white piece of furniture that is laminated and I want to simply distress it or create some vintage look! I’ve seen the process from dark laminated wood to white distress but I haven’t seen white laminates to white distressed. Just by sanding it? no need of painting? This is such a good question! Here’s what I would do… instead of simply sanding the white laminate (because under the laminate is fuzzy particle board) I would paint the piece a dark color, then paint white over it. Then you cal lightly sand the edges and corners just down far enough that that dark color of paint shows through. Does that make sense? I have a white laminate headboard/shelf and nightstand that I want to chalk paint. 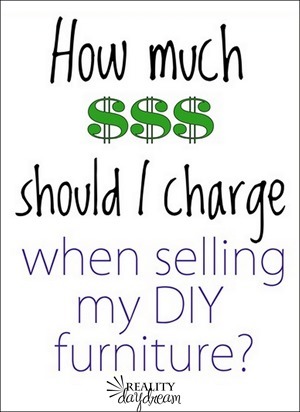 If I am doing so do I still need to sand and prime the piece of furniture? I haven’t done much with chalk paint. But supposedly one of the benefits is that you don’t need to sand or prime. You should go for it! You can stain laminate and even without sanding and prime. Get a stain with no poly… I repeat, no poly in it. It’s straight stain only. You will have to coat it twice to get it a solid color but it works as a base primer and stain. After dry then you can add a polymer over the top to protact it if you desire. I did my cabinets with a very dark color over a light-medium color with one coat and dabbed with paper towel as i went. It gave it a leather type weathered look and worked great. Hi Jason! I bought an old bedroom set to restore. Didn’t know what laminate was. It was a cream color and I’m painting it white. I have spent total of 8 hours painting two base coat of paint+ primer and I’m planning on painting it two more times with the color I want. The problem is, when something touched the prices the primer chips off. I’m so sad. Should I sand the whole thing down and get rid of the primer and scrach the surface for bundling? I probably am better off throwing all the prices out than doing that. Please help! Is there anything I can do to save my work? Thanks. I would use an oil-based primer. My favorite is the aerosol Kilz spray primer. Just make sure you shake it really good or it will have a gritty texture that will need to be sanded afterwards. Then you should be able to use ANY paint over top of that (even water-based)! I just purchased a dining table and bench with a veneer top. I’ll sand it with 220 grit and then would like to chalk paint it. Do I have to prime first? Thanks. I purchased a used headboard that I would like to restore and stain. I thought it was solid wood but after my husband got it home I see that one of the pieces has damage. And it is not solid wood. It is I think cork board with something over it. It’s a very thin piece that looks like wood. I don’t know if it is laminate or veneer. It’s probably about 1/8″ thick. Can I stain over this and if so do I need to sand it? Also do you know how I can fix the pieces where the “wood” topping has come off and is just corkboard? The damage is just on two corners so not in the middle of the piece of furniture. I took pictures to show you but it won’t let me post them. Any way you can help me? If it’s laminate, you’ll have to just paint it. But if it’s a wood veneer, you can totally sand and paint! Just make sure you don’t sand too deep past the thickness of the veneer! I have a mid-century 2-tier veneered side table. No damages and I would like to staying the top and painting the rest. Can I paint it without sanding or a light sanding will be all that I need to do? If it has any glossiness to it at all, I would sand it before priming/painting. But just a light sanding with 220 grit should do the job. Enough to dull up the surface a bit. I have a dining room table that is probably 15 years old. The top has a design on it and I thought it was wood on the top. (Shows you what I know). Over the years and 4 children later, the table top has lost the “finish” in many spots and in some areas has a slight bubbling effect. (I was told this was from leaving glasses on the table that sweat that caused bubbling). Is there any way to save this table. It has great sentimental value. I have a solid wood dining room table that I thought had a wood top. The table is probably 15-20 years old. But after 4 kids the top is beginning the show wear. It is peeling some of the finish off. (You can literally scratch it off with your finger nail.) But it also has some bubbling in spots where I was told that is from kids leaving glasses on the table that sweat and caused the bubbling. The table has a design effect in the top. Around the edges of the table it seems to be a different material because it has no damage. Do you think this can be repaired? I paid a fortune for the table and would like to save it. i just got a used desk for 15 dollars at a tag sale but it has a wood laminate finish. after i sand it down like you instructed why kind of spray paint should i be using? one that covers wood or one that covers plastic? I purchased a brand new piece of furniture with a wood veneer finish. It came in dark grey and I want to paint it white. Since it’s brand new and has no damage, is sanding necessary? Hey Sabrina! Unless the existing finish has a flat or ‘matte’ feel and appearance, I would lightly sand the whole thing with 220 grit just to cut down the shine… which will allow the prime and paint to stick better. Hope that makes sense!! Can you help me fix a boo-boo? We bought a cheap desk for my son so he could sort out his finances. He was in a big hurry, but I wanted to paint it first. The laminate on the top surface was badly damaged and gouged, so I sanded the crap out of it. I then painted it using a primer/paint-in-one (recommended by Rona for the project). Because I had sanded it down to the particleboard, the paint soaked right into it and the surface swelled up. I sanded it down again and repainted – which only made it worse! I’d like to fix it: should I sand it down and use a varathane coating first to seal the particleboard? Yikes, we’ve not run into that problem, but I know exactly what you’re talking about. I’m thinking if you sealed it with an oil based poly or primer, it would accept the paint better. But truthfully I’m not sure! You can always re-veneer the table. home improvement stores carry rolls of wooden veneer! Oh noooo! That’s such a bummer Donna! Were you trying to stain the top? If it’s not wood, staining definitely won’t work. So you have to paint the top darker to get the look you’re wanting. I picked up a piece off the curb, very cute, but… it would be my first project, I know nothing! The top had absorbed moisture (it was night time, very humid when I picked up), and at the edges was actually kind of spongy – I could dent it with my nail. So… what is that made of, and what do I do about it? Thanks! Without damaging the surface, can I put bowels of hot food or cold glasses that will sweat on a laminate table table top? I always wipe and dry it after eating. My father has just made a water stain on the veneer cabinet in the nursery, do you know anyway for me to get rid of it? Any advice you can give me would be greatly appreciated. Oh man Kirsty. It’s really hard to know what to tell you without seeing a picture. Is the grain raised? 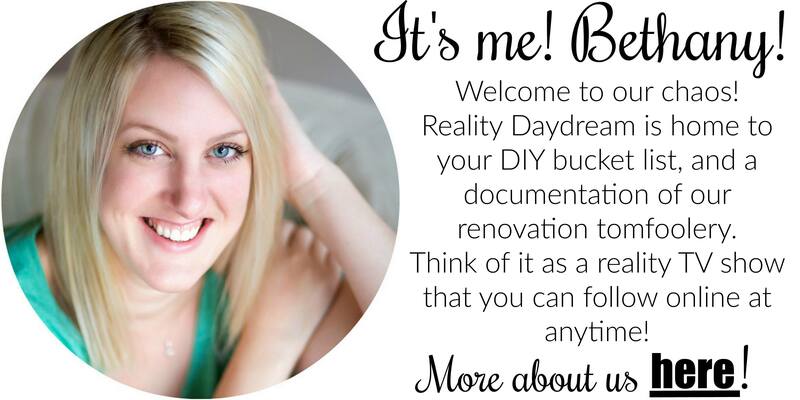 Could you email me at beth@realitydaydream.com with a photo and more of an explanation… and hopefully I’ll be able to help you! So I have old hotel furniture that has that plastic fake Shiny looking laminate. I actually want to turn this into mirrored furniture. Should I peel off the laminate and glue mirror or just sand down the laminate and glue the mirror? Liana, if the laminate seems to be pretty sturdy (not loose / flapping in places), you should be able to sand it down and glue the mirrors directly to it. Let me know how it goes! And pleease send pics when you’re done! Great post and thanks for explaining it so easily. I am in the process of figuring all this out. I’ll be pinning your post for future use. So I just bought a vanity that says it is made of MDF and hardwood veneers-http://www.homedepot.com/p/Home-Decorators-Collection-Brexley-37-in-Vanity-in-Warm-Chestnut-with-Marble-Vanity-Top-in-Beige-BXCNVT3622D/204074344?MERCH=REC-_-NavPLPHorizontal1_rr-_-NA-_-204074344-_-N this exact vanity. I want to paint it blue but being it was over $500 I want to be sure I dont mess it up. Would you recommend sanding this piece first or just priming and then painting? I have been getting mixed reviews from home depot/ lowes paint representatives on how to accomplish this! Can you stain a veneer after you sand it? Also what brands of paint, and primer would you recommend? Anything on top of the paint? If it is WOOD veneer (not laminate) and it doesn’t have any sealant on it, you can totally stain it! As for primer and paint recommendations, I love Kilz primer (the oil-based one! ), and for paint, I use spray paint a lot because it gives such a smooth/ professional finish, without brush strokes. AND it’s oil-based which is always more durable. If you have a paint sprayer, I recommend Benjamin Moore or Sherwin Williams. Don’t go cheap when you’re buying a can of paint. You truly get what you pay for. I seal with Minwax polyurethane (be sure to used water-based if you’re polying over WHITE. Because oil-based poly yellows over time. My uncles kitchen cabinets made of (I believe) thin, plastic, faux wood laminate glued to particle board. Can these be sanded and painted? Yes! You can sand/paint laminate… you just can’t stain it. Hope this helps! I’ve read the info you have on veneers and laminates but there is nothing on repairing laminate. Would the process be the same as with veneer? Denyce, this depends if youre planning on painting the piece? If you’re painting and there’s just a small chip in the laminate veneer, you could fill it with wood putty and sand it smooth and flush with the rest of the veneer and then prime and paint. Does this help at all?? We have a bookcase that’s been in the family for oh, probably 15-20 years. It’s particle board (ready to assemble with a screwdriver) with a thin layer of what is now appearing to be wood-grain paper rather than plastic. It’s held up really well, but recently the paper started peeling in the dips of the trim revealing its true nature. Oh, and out of curiosity, does this finish have a name, too? I agree so much! So frustrating! Hi! So glad I found this blog! So I just bought a table today from the Habitat for Humanity store. It’s two-tone…. has a light, wood veneer top and the rest of the table has a darker, cherry finish but is all solid wood. It really is a gorgeous table! Wish I could show you! The veneer has a small chip in the corner, and it looks like a kid tried to carve his name in the top. It also has some buckling in it, possibly from heat. The rest of the solid wood part of the table has some scratches, normal wear and tear. I want to “restore” the wood veneer, just didn’t know if that was possible. I bought this table for 200 bucks, hoping I could make it into something my own since I have 4 children and desperately needed a table (we were eating on the floor). Any suggestions? I’d like to stay with the “two-tone” look. My boyfriend says he can just sand it down, and poly and stain it. My mother, on the other hand, is convinced this table is a lost cause and I wasted my money…. doesn’t think I’ll be able to do anything with the wood veneer. Your input would be greatly valued and appreciated. Thanks!!!!!!! I bought 2 end tables and a coffee table. They are veneer and would like to know if I can strip and stain them. The tops of all the tables are really worn but no chips or pieces that are broken off. Vicki is it wood veneer or laminate veneer? If it’s wood you can strip and stain. If it’s laminate, you can either leave them as-is or paint. Hi all, I have just put up plain white cupboards in my room and sons room. I think from reading this post these are laminated. They were put up 5 days ago and not yet used or cleaned properly. the boards are white and glossy. All plain. The wood seems to be board instead of real wood (went for a cheaper option). What do I need to buy to repaint these into lively colours and not damage my new dull furniture. Please help. The handles also have not yet been fitted until i decide what to do. I have a black, round table & chair set that I’d love to turn navy blue (decided to spruce up my craft room with new colors, navy & bright pink)… I’m wondering if something like a table that will be used often can be successfully painted? I think it’s laminate but it’s not shinny (it’s more matte textured). Could I simply put a light coat of satin navy spray paint on it instead of bringing out paint brushes & paint in a can or would that end up not giving it enough coverage? Any ideas you have I would welcome! 🙂 Thank you! Hi Christina! Spray paint will be fine, but make sure you spray on some primer first. And for the most durability, be sure to seal with polyurethane or water-based poly like PolyCrylic by Minwax. Hope this helps! I found your site while looking for ideas for organizing and was enthralled with all your creative and inspirational ideas! You are a treasure; I appreciate you sharing all your creativity with us! Your generous use of photos and sources make me feel that I can try these ideas, too! Thank you! You’re super sweet! Thanks for taking the time to comment! I’d like to paint / refinish a table that has a woodgrain laminate top. I don’t expect I can remove it / rough it up enough to paint it, can I? Ideas or suggestions, please? Is there a way you’d recommend repairing a white laminate (Formica) table top that has a burn mark (brown, down to the backing), please? I would think that should work… as long as you sand it down good and prime with a good oil-based primer. Good luck!! I have an old HEAVY church pew I want to refinish.. Appears to be solid wood with varnish (?) finish..sand, prime and paint? Thoughts? If the varnish is dull, you could probably skip the sanding and jump right to priming. But if the varnish has a glossiness to it, you’ll definitely want to dull that down with 220 sandpaper so the primer will have something to grab onto. Hope this helps! I have a desk hutch that appear to be real wood but I can’t tell for sure. It’s a lighter color and it seems pretty darn solid. It diud screw some shelves onto the end of it before. Is there a test I can do to find out if it real wood or some cheapy made hutch? It has what looks like strips of wood on it. I don’t think it’s OCB or whatever that pressed wood is but am not sure if it could be something cheaper covered in some cheap type laminate. I do have pics if anyone needs them. particle wood cabinets with a very thin plastic whitewashed oak look. Can I sand and paint these? What type of paint will not raise or swell the particle wood ? Cindy, we’re honestly not really sure on this one. WE haven’t dealt a lot with particle board that has that papery film on it. Is there an inconspicuous spot that you can do some testing? I think we would try deglossing, priming and painting. But we can’t guarantee good results since we don’t have direct experience with this. Sorry we can’t help more! Beth, I sincerely appreciate the honesty! , Painting is one option, My friend suggested veneer or a laminate to glue over the top of it, and use a router to follow the edging already present… along with painting the base cabinets a very similar color…. the inexpensive options…. I guess I will find out! Sounds like a fun project! I would definitely strip as much as you can before sanding. At least it’s not laminate! GOod luck! I would love to hear the details if you had any luck refinishing this peice! I have a 1950s bedroom set I would like to refinish but I am nervous. I just bought a lovely used table. My daughter says the top is laminate. It is nice,but a little dull looking. What can I use for a little shine? please send notice to my email regarding your response. Just bought a nice oak dining room table that has bubbles in the veneer where the sun hit directly on the table. There are no obvious loose places. Your advice in refinishing to match the perfect leaf that was stored elsewhere. I would be happy with any other color as long as it is a natural wood color like maple, oak, cherry, pine, etc. Is it possible to stain it another color? If so, how should I proceed? Unfortunately, because it is laminate, you cannot stain it. The only option is painting. Laminate is basically PLASTIC that is printed to look like wood, so if you put stain on it, there would be no woodgrain for it to soak into. Does that make sense? There are lots of ideas for painting floors if you want to do a google search! I have a 1980”s oak table (laminate top) and 6 oak chairs. After I sand & paint, what can i put on top of the painted table.? Should I put a clear coat of varnish? I live in a 10 year old house that has white cabinets. I think that the doors of the cabinets have a veneer on them, not sure what it’s made of. It is beginning to peel/come loose on the corners of the cabinet doors. I was wondering if this could be taken off of the whole cabinet doors? I don’t think that the whole cabinet has the veneer, I think the rest is just painted white. Or am I incorrect in thinking that? If so, what can I expect underneath? Will it be wood that can be painted or stained? I would really like to get rid of the white cabinets, but don’t want to replace. Please advise if these types of cabinets can be transformed. HI Janet! It’s hard to know about the veneer without seeing it. If it’s just a few corners here and there, I would just squeeze some wood glue in there and put a clamp on it to fix the veneer curling up. If you tear the veneer off the faces of all your cabinets, you might have a bigger project than what you bargained for. Sometimes it’s very difficult and chippy removing veneer, and you never know what surface you’re going to be left with once it’s removed. If you’re set on this idea, I would start on a cabinet door that’s in an inconspicuous place in your kitchen and carefully start pulling back the veneer to see how easily it comes off and what kind of surface is underneath. I think you’ll have less work for yourself if you just repair the damaged veneer corners and paint. Let me know what you decide, and be sure to send pictures! I have an old desk that the top has what I assume is laminate. the surface has chipped off in many places and someone let water sit on it and now these spots have swelled into bumps. I really don’t want to replace the laminate, I would rather just paint the whole thing but is there something special I would have to do to the particle board underneath to have a smooth finish with paint? will just sanding do it? I have recently bought a flat (eeek!) and I have a built in wardrobe with matching chest of drawers and bedside cabinet.This is great except they are covered in a pretty ugly, orangey laminate which is also coming at the sides. I peeled it off one of the drawers of the cabinet and it came off easily. I now want to paint what’s underneath – it’s super smooth and shiny – is that mdf? Is there a certain way to paint it or will it just look rubbish (worried about going for it with the massive wardrobe if i shouldn’t be peeling it off!!)? I think I have the latter, was set to prime and paint, then changed my mind, running out of time and need the room done by mid March. So I stripped the primer off, pain in the “boo-hind”, but that’s done now and of course it’s now peeling (thinner than paper peels) in certain areas and exposed the particleboard that’s underneath (btw these are cabinets, but not in a kitchen). Before I’d read this I’d started staining to cover the flaws, it appears to be going alright, assuming that stripping the primer, scraping, and scrubbing as roughed up the surface enough that the stain will take?? when you said you can’t stain it as it isn’t wood, what are the warning signs that what I’ve done so far is going to fail? Just finished staining some of it about ten minutes ago! Thank you for your time and all the information you both include on this sight, soooooo helpful!!! Also, could I use something like Miniwax Polyshades over the sanding that I have already done? Or am I going to have to paint it now? My other bedroom furniture is very dark wood and I just want it to look nice together. thanks. Debbie, unfortunately we don’t have any experience with this type of situation. If it were us, we would put new veneer on top (you can buy rolls of wood veneer at your home improvement store). You might want to do some research about Polyshades and see what kind of experience other bloggers have with this. Minwax isn’t our favorite (we prefer Rustoleum stains) so we’re not familiar with the Polyshades. Best of luck! Nice post. And yet, my OCD is compelling me to share a minor error with your definition of laminate surfacing which, in fact, always contains plastic and is actually not always printed to look like wood grain. Formica for example comes in God-knows how many different patterns like marble, checker print, you name it. Another interesting fact: While All laminate contains plastic, the major component is actually paper with most laminates containing only about 30% plastic constituents. I was in too much of a hurry and purchased a 72 inch double vanity for our DIY master bathroom reno. I really hate the color; but like everything else about it. It says that it is birch veneer and wood. I want to paint it black. It’s new. Do I really have to sand prior to painting? Also, I’ve painted my ugly kitchen cabinets with Chalk paint. LOVE the look; but doesn’t stand up to wear and tear very much. I don’t want to go that route again even though it was so easy. I would love to just be able to spray paint the whole vanity with black paint after I use a high adhesive primer. Would that even work? Thank you so much. Leah, does your vanity have a dull sheen on it now? Or is it glossy? If it seems even a little glossy, I would just lightly sand it with 220 sandpaper. I know sanding sounds sucky, but you don’t have to put your back into it or anything. Just lightly rub it down (like you’re washing it) with the sandpaper. This will cut down the gloss and give it more of a matte finish… and that will allow the primer to grab on a lot better. I think you’ll be glad you did. I have cheap builder grade cabinets that I think is veneer and cheap contact like paper on sides by window and on end of cabinets. . . I’m installing dark hardwood and want a white kitchen but afraid of cabinets and contact paper surfaces. Any suggestions? Sheila, you can paint over veneer, as long as it’s in good shape and not chipping. As for the paper-like sides, I would just peel as much of it off as possible, and sand it smoother before painting. You just don’t want to have any loose pieces. Be sure to send pics when you’re done!! With laminate, techically you cant “stain” it, but products like Miniwax Polyshades allow you to darken the wood exactly like a stain. Its a mix of polyurethane and stain, so you apply it over the top like a paint. The effect is beautiful. .
Hi Beth, You are so helpful! Which vanity should I use in the bathroom? solid wood, veneer, MDF or others, so confused. Solid wood will always be the best choice! It will last the longest by far! Hi I am rather confused and hoping you can help me. 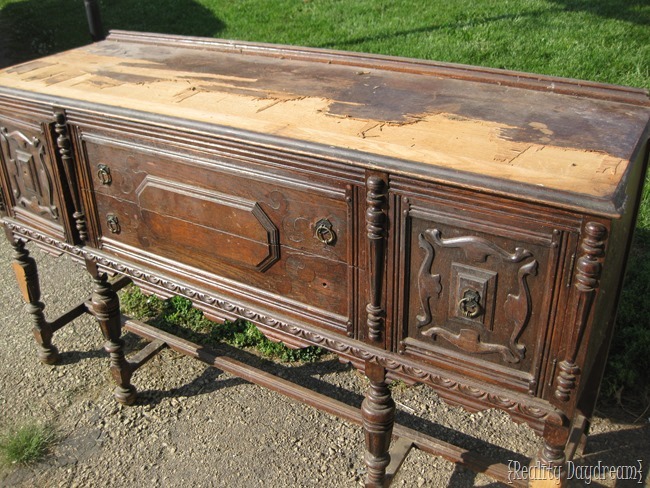 I have a gorgeous old antique dresser that has a shiny wood veneer on top with a hardwood underneath. I would like to paint it a darkish teal type of colour with a shabby chic effect. (I have photos of what I want when I googled it but don’t know how to attached it here!!) When it is completely painted, i wanted to sand the edges back to see the wood. But when I went to Bunnings today they said the only way I could get the paint to stick with a wood veneer, I would have use a primer as sanding wouldn’t be enough to keep it sticking. But then they said that the primers have white and colours, but when I sand it back to the wood, I don’t want any white to show through. I like being able to have a bit of washed look in areas. Sure I could buy a colour of the primer to be close to my acrylic, but I want to do more furniture for a hobby and maybe sell them with different colours and don’t want to have to get a primer as close to that colour each time! I have lots of colours in mind! I simply want one colour showing when I sand it back. Are there clear primers out there? Bunnings didn’t have any nor know about any available. Really sounds confusing, but I am hoping you can help me please!!! Hi Lara! Good question! 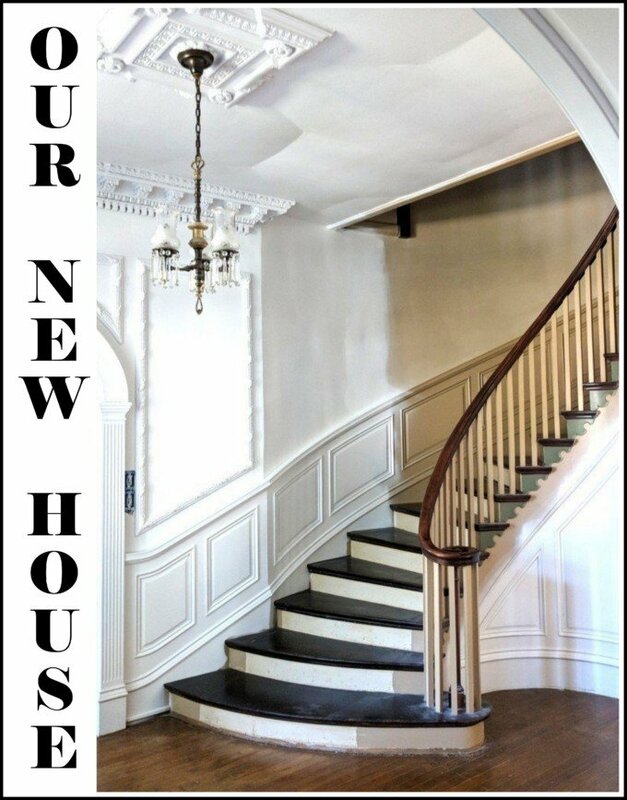 Since you’re going for a shabby rugged look with the edges sanded down to the wood, I would just be sure to really rough up the wood thoroughly before applying paint since you’re skipping the priming step. And I would use a flat sheen paint or chalk paint as they will stick better. It should work fine for you! Hi, I have painted an old coffee table, which looks great but i forgot to sand it down before i started, so after quite a few coats the paint is chipping off. Is there a way i can rescue this table without having to scrape all the paint work off. Many Thanks. I bought a great used round pedestal table with the intent of refinishing it. It weighed a ton and the guy I bought it from said it had originally cost $2000…..so Iassumed it was solid wood. Not the case, I began sanding off the original finish and relaized what I was seeing underneath was partical board or MDF. It’s only showing through the wood veneer on top in a couple places. I’m wondering if I can have the veneer replaced. I also began sanding the base of the table which is round hourglass like curves (as if it cam off a pottery wheel) and it seems that all of that may be MDF, no wood at all. Not sure what to do now. I love the the table and got it for a great price but it’s now half sanded and half not and I’m not sure if I will be able to restain the MDF. I’m not interested in a painted piece. Any adive would be a huge help. Thanks! I am so sorry you are going through this. it is about the worst feeling ever when you sand through something. So, there are a couple of things you can do. Paint it (which you mentioned not being interested in), Try and stain it (the mdf will be darker and noticeable), or replace the veneer, this is actually not terribly hard and you can usually find veneer online or at a local hardware store. If you have any questions don’t hesitate to ask. Yes! Finally something about home. Is oil based paint the only type of paint that can be applied to laminate? I have a large old laminate wardrobe that I would love to do something with as it is very useful, but, I hate the idea of using oil base paint. Can you suggest any other type of paint? I live a lone so the wardrobe will not be getting a lot of heavy duty wear and tear. Lis, water based paint should be fine, especially if the piece isn’t going to get a lot of wear and tear. I would be sure to sand really we’ll before applying primer though. Good luck! Send pics when your done!! Thanks for the info! I am painting a bathroom vanity in my new house. All was well when I painted the wood veneer, but things turned sour when I *attempted* to paint the side of the vanity. Turns out it is laminate! Pftt. You’re so sweet! Did you remedy your laminate situation? Dave, if they’re in good condition… we say go for it! I would definitely make sure you sand them well and use a good oil base primer for ultimate durability since cabinets get a lot of wear and tear. But that would hold true for wood cabinets too. It’ll be a big project, but I bet you’ll love the results! Be sure to send us pictures when you’re done!! Thanks for the info. I found it very helpful. I have one question here.. As an expert which one you think is more durable and practical? Veneer or Laminate? Hello there, I am refinishing an old table top and after sanding off the old stain the veneer has been worn down in quite a few areas revealing spots of particle board. How can I repair these spots so I can stain it? Will a darker stain effectively cover these spots so it’s consistent ? One of the difficulties of veneer is sanding. I rarely sand veneer with anything less than 220 grit. Unfortunately we have both learned this lesson through trial. If you stain it the particle board will show because it will not absorb the stain evenly with the rest of the veneer. So you can either choose to call it rustic and live with it or replace that portion if the veneer. I attached a link for you to better understand the process of replacing small portions of veneer. Thanks for this great information ..this information really very helpful to me…. Thank you for giving the information. Our furniture agent too used the same technique while laminating our furniture. I too would like to know how to repair chipped laminate. I have a very well made laminate topped table but through 20 years we’ve destroyed the top with nicks dings and even some areas pulling apart. I’ve actually begun applying wood putty and sanding smooth but I’d like to know if that’s the best way to handle this job? The benches and table base are extremely well built and HEAVY SOLID WOOD, I’d hate to dismiss the table top or try finding someone to build another, which really isn’t a bad choice but who wants to pay for something if they don’t have to?! If it is a painted piece or will be painted then I would say you are OK to use filler or Bondo wood putty. If it isn’t painted and you want it to closely resemble the existing wood you will need to replace sections of veneer. You can accomplish this by cutting out a section of veneer using a razor blade and a square. 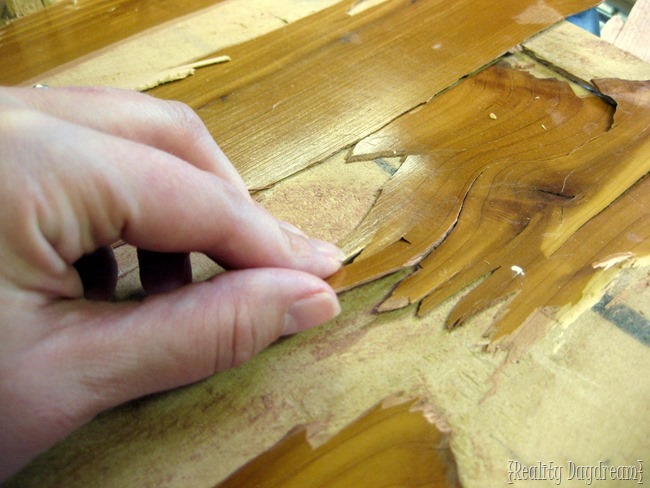 Then glue a piece of wood/veneer similar to grain and color, sand, and feather in your stain. and lastly poly or lacquer. Another option would be to replace all the veneer. It would allow it to be uniform. I hope this helps. Please send pictures when you are complete. Love this tutorial — people never believe me when I tell them that you can paint laminate! From now on, I’ll refer them to your link. Great explanation! Thank you for making that so clear. And Kenz @ Interiors by Kenz is right. You are experts! Solid information. And, you are definitely an expert. I wouldn’t consider going to anyone ELSE with furniture painting questions. Thanks for this post. I purchased a nifty little side table at an estate sale that has a great style but has a laminate top. Because the laminate still looks new, I was thinking I would have to paint the wood portion and leave the laminate. Good to know I have the option of painting the whole piece! Your blog is one of my favorites….keep keeping us posted! !